A couple on their honeymoon come across the body of a little boy, washed up on the beach in Greece. Photographers, they create a picture that the world needs to see. Michael Herold in Theatre LILA's Suitcase Dreams. A golf bag, a cell phone, a diamond ring, an old Sam Spade novel. These are just a few of the things that end up in the lost and found at a major airport. In this tongue-in-cheek play on film noir, the gumshoe in the detective novel finally tracks down his reader and escapes the limbo of lost luggage. 1960s. A teenage girl, who is also a military brat, confronts racism in her own family as her mother helps teach a Thai war bride how to cook American food for her GI husband. A man with a rare hearing condition is tormented by the sounds of daily life. His refuge is working in a special — very quiet — section of the Newberry Library. Much to his surprise, one day he meets his match, a woman who struggles to be heard. While running on the beach one morning in his hometown in Newfoundland, a man discovers a group of suitcases washed up on shore. Soon the whole town is working to figure out where these suitcases came from, what to do with the contents, and how to return them to the proper owners. A middle-aged woman can’t find her keys, so ironically she has to cancel her appointment with a clinic doing research on the children of Alzheimer’s patients. She recalls her father, a lawyer who was in the habit of losing things. He has always delighted and inspired her. Now he doesn’t remember her at all. 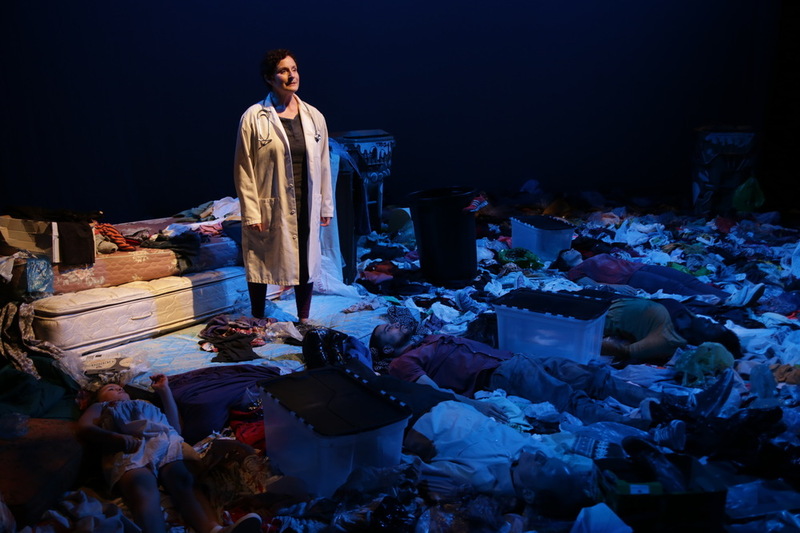 Laura Gordon in Theatre LILA's Trash. An epidemiologist working for the World Health Organization is profoundly affected by the people she meets in Sierra Leone, as she works to treat those affected by Ebola. She is particularly moved by the children who survive by sorting through mountains of trash.